It's the middle of winter so what better time to reveal 16 Mud Riding Secrets to make the most of your time in the muck. That's right, we've got 16 smart tips to help you when riding in mud. Inside this issue we hit the trails of the Victorian High Country, we blast the South Coast of NSW on our annual Reader Ride with KTM Trail Tours plus we hit the Kenda Rally. We take an inside view of the almighty Finke Desert Race where a father guides his daughter through one of the toughest races in Australia. 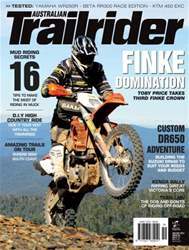 We look at the unwritten rules of trail riding and we jump on and ride the Yamaha WR250R, KTM 500EXC, Beta RR300 Race Edition and the KTM 450EXC. We also look at what makes the Suzuki DR650 so damn god for adventure riding and the different shades of bling it takes to do it.